About 10% Australians have gallstones, with a much higher incidence in older people. Although they are often noticed as an incidental finding when a radiological examination is being done for another reason, there are some classic symptoms that point to gallstone disease. Gallstones occur in approximately 10% of the population. The vast majority of people with gallstones do not realize that they have them until either they have a scan, in which they show up as an incidental finding, or they develop symptoms from the gallstones. Gallstones can cause a number of symptoms ranging from the pain of different types and intensities to fever and jaundice. The most common type pf pain experienced with gallstones is called biliary colic. This typically will come on within about half an hour of eating a meal. The pain tends to be worse after a fatty or oily meal. A patient will describe a presence of a griping or colicky pain in the right upper part of the abdomen just below the ribcage. The pain is colicky in nature and will typically have crescendos of severity. The pain can radiate to the back and to the right shoulder tip. It typically will be associated with nausea and occasionally vomit. Pain lasts for up to several hours before resolving on its own. The second type of pain that can be caused by gallstones is due to acute cholecystitis. 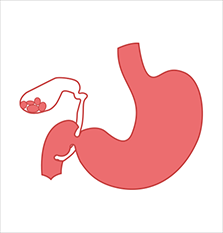 This occurs when the gallstones cause an inflammation in the wall of the gallbladder. The pain is, therefore, more inflammatory in nature and a person will feel very uncomfortable on moving. The pain is typically in the area below the right ribcage. It is commonly associated with sweats and fevers. This pain usually will come on over a number of hours and can last several days. Often it will require a course of antibiotics or even a hospital admission. Gallstones can also cause jaundice if they travel into and obstruct the common bile duct. Jaundice is first noticed by a yellow discoloration in the whites of the eyes (sclera). If jaundice becomes more pronounced, it will be apparent in the skin and may be associated with itching. Often the gallstone will spontaneously pass through and unblock the common bile duct, leading to a resolution of jaundice. However, it is typical for jaundice to reoccur on the passage of the next stone. One of the most serious complications of gallstones is pancreatitis. This occurs when a gallstone lodges right at the lower end of the bile duct as it joins with the pancreatic duct. The back pressure on the pancreatic duct can cause it to become inflamed. Because the pancreas contains and secretes digestive enzymes that are designed to help digest proteins, an inflammatory process in the pancreas can cause the beginning of an autodigestion of the pancreas itself. In the majority of cases pancreatitis is self-limiting but occasionally it can lead to a condition called necrotizing pancreatitis which can be life-threatening. Do gallstones always cause symptoms? 10% of the population have gallstones of which 10-20% of these patients will become symptomatic. Therefore the majority of people with gallstones never experience any symptoms. If you have been diagnosed with gallstones but have never noticed any symptoms from them, then it may not be appropriate to consider surgical removal of them. The most common investigation for gallstones is the ultrasound scan. This test is usually fairly accurate for picking up typical types of gallstones. Your doctor may order a set of blood tests to ascertain whether the gallbladder is inflamed, or whether there is any evidence of early jaundice. If your doctor is concerned that the problem may not be gallstones but may be an ulcer or acid reflux, he will organise a gastroscopy test. The final investigation that may be considered, if your doctor requires further information regarding the anatomy of the gallbladder, its connections and where the gallstones are, is an MRI scan of the gallbladder and liver. This is called an MRCP (Magnetic Resonance Cholangiopancreatography). Do gallstones always require surgery? If gallstones have started causing symptoms such as pain, then it is likely that in the future symptoms will continue and may get worse, with the risk of more severe complications such as jaundice and pancreatitis. It is for this reason that your doctor will recommend that you have the gallbladder removed surgically. This is called a cholecystectomy. These procedures are performed laparoscopically (keyhole surgery). Therefore he will recommend the procedure – laparoscopic cholecystectomy. The rationale for this recommendation is that the risks of complications from the gallstones exceed the small risks of surgery. If you have been diagnosed with gallstones on a scan but have never experienced any symptoms from them, or your doctor thinks symptoms you are experiencing are from another problem such as a peptic ulcer, surgery may not be indicated. An asymptomatic gallstone is most likely to remain this way and not cause any problem throughout the life of the patient. In these cases it is estimated that the very small risks of surgery outweigh any risk of leaving the gallstones in place. Therefore surgery is not recommended in these cases. Can gallstones be treated with lithotripsy like kidney stones? This is a common question and unfortunately, the answer is no. Lithotripsy involves the ultrasonic breaking up and fragmentation of kidney stones, which then travel from the kidney and are excreted in the urine. Lithotripsy energy cannot be used near the gallbladder as there are too many very important anatomical structures such as blood vessels that may be damaged. In addition, the fragmentation of a gallstone would mean that it will be more likely to travel into the common bile duct and cause complications such as jaundice and pancreatitis. These complications can be very severe. Is there medical treatment to dissolve gallstones? There is a drug which helps to prevent the formation of gallstones and will also indeed decrease the size of some gallstones. Historically this has been used in elderly patients who are not fit for anaesthetic. More recently, these drugs have been considered in patients who have had bariatric or weight loss surgery, that prevent them developing gallstones as gallstone formation can be a consequence of rapid weight loss. However there is no substantive evidence that this is beneficial in the long term. Therefore at present medical treatment of gallstones is not proven to be effective, although prophylaxis to prevent formation of the stones may be of benefit to some patients. What does gallstone surgery involve? The procedure of laparoscopic cholecystectomy or removal of the gallbladder by keyhole surgery involves a short operation under general anesthetic. The procedure will take from half an hour to an hour. It is performed via three or four small cuts measuring between 5 mm and 10 mm long. The gallbladder is removed along with the gallstones in a retrieval bag. The wounds are sutured and the patient will go home either on the same day or the morning after surgery. Pain is not normally a major issue and patients are comfortable and mobile following surgery because there have been no big incisions made in the abdomen. Patients can resume working within 1-2 weeks of surgery. Risks of laparoscopic cholecystectomy are very low, however, in any operation, there is always a small risk of bleeding or infection in the skin wounds. In laparoscopic cholecystectomy there are specific risks of bleeding from where the gallbladder is removed from the liver, leakage of bile from this area, and damage to the bile duct, requiring more complex surgery in the future. These risks are extremely low and are surpassed by the much more significant and common risk of serious complications if symptomatic gallstones are not removed. What are the risks of not operating? If a patient has symptomatic gallstones then it is likely that the gallstones will cause trouble in the future. There are potential risks, not only further episodes of biliary colic and/or acute cholecystitis, where the pain in the upper abdomen occurs. There are potential risks of both jaundice developing with infection in the liver or acute pancreatitis which can occasionally be life-threatening.